Trisul is most effective monitoring perimeters of trust boundaries. In an enterprise scenario, this usually means monitoring on either side of a corporate firewall. This works beautifully because you can log all kinds of network & security data exchanged across your boundary by just monitoring a few external ports. There is a however a big problem in the real world, the humble web proxy. Proxy servers like Squid, Bluecoat, F5, Cisco, etc make it easy to apply web controls but they also obscure the real internal IP address. Traffic upstream of these proxies contain the IP address of the proxy device and not of the actual endpoint. This means you can no longer track your endpoints because all traffic will appear to originate from the proxy. Here is a diagram that illustrates the problem. All traffic will appear to come from 10.0.0.200 (the proxy IP) and you will not be able to tell apart user 10.0.0.166 activity. The other alternative is to deploy trisul behind the proxy server, but that is sometimes impractical because that may require mirroring multiple ports. The recommended solution is to use the X-Forwarded-For HTTP header. Trisul supports the X-Forwarded-For, also known as XFF HTTP header which contains the end user IPs. Most proxies including Squid have the ability to add an X-Forwarded-For HTTP header. You need to enable this if not already enabled by default. where the value is a comma+space separated list of IP addresses, the left-most being the farthest downstream client, and each successive proxy that passed the request adding the IP address where it received the request from. In this example, the request passed proxy1, proxy2 and proxy3 (proxy3 appears as remote address of the request). To enable XFF tracking in Trisul you need to edit a parameter in the trisulConfig.xml file as specified below. The XFF feature require a few supporting features to be enabled as well. Make sure these are enabled in the trisulConfig.xml file as well. The above features are needed because Trisul needs to reassemble the HTTP headers accurately to reliably process the XFF headers. Note You need to restart Trisul for this to take effect. 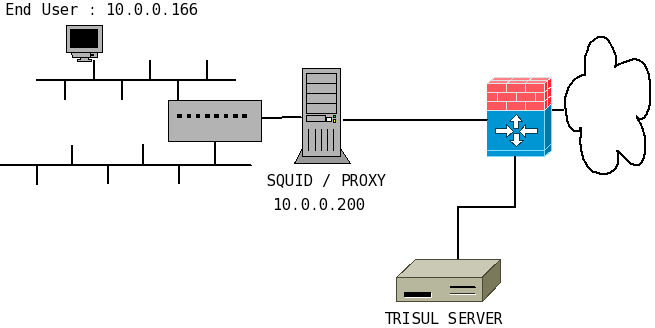 With XFF enabled, Trisul will replace the IP address of the proxy with that of the endpoint in all monitored objects. All traffic, flows, packets, alerts, and resources will have the IP address of the endpoint as if the proxy never existed. A small number of bytes up until the XFF header will continue to be metered against the proxy. If the XFF header is not found the entire flow is metered against the proxy. The proxy becomes transparent as far as HTTP traffic is concerned. Raw packets stored by Trisul are re-stamped with the IP of the end station.